Shannon's blog Make It was one of the first sites that got me hooked on reading blogs. Over the holidays I spotted her posting about her transition from screenprinting to soapmaking - I'm sure there are plenty of folks out there with multiple skills, interests and passions who face the same dilemma of wishing they could give something else a try. So when I heard that she was ready to share her wonderful creations, I jumped at the chance to ask her a few questions. I hope Shannon's story inspires you, it certainly reminded me that it's never too late to reinvent yourself! 1. What was it that made you want to start creating? Did something specific trigger it? I've always been artistic and somewhat crafty, but I really dove into crafts after graduating from college. I wasn't used to coming home from work and not having any homework to do. If you're a single, childless college grad whose only responsibility is to get yourself to and from work, that leaves you with a lot of free time. I didn't have cable (I still don't, and I find this is pretty common among crafty business types) so I decided to pick up a hobby. I started out with jewelry, then dabbled with batik, block printing, screenprinting and now soaping! 2. You've recently made the switch from paper goods to soap. Can you tell us a little bit more about that decision and what prompted the shift? I know a $4 sheet of gift wrap isn't for everyone, so I wanted to expand my offerings into some other areas and possibly reach a wider range of customers. Since I started doing screenprinted papers, I've always wanted to use those papers to package some other product. I'm a sucker for a pretty wrapped soap, so I had approached some soapers with the idea of doing a collaboration, but that never resulted in anything, so I decided to take matters into my own hands and teach myself. 3. How do you come up with your creations? Can you walk us through your creative process when dreaming up new scents/combinations? Well I'm very inspired by food, and I'm also inspired by the idea of taking fairly mundane household ingredients and kind of transforming them. Some of my ingredients come straight from the kitchen: honey, turmeric, poppy seeds, almond flour. The look of the soap is just as important to me as the scent and the functionality. So all those elements are taken into consideration. I drink a lot of tea and my boyfriend is into coffee so I have been brainstorming ways to incorporate those, but I'm not quite ready to share yet. 4. One of the hardest things for artists to do is to stand apart from everyone else. 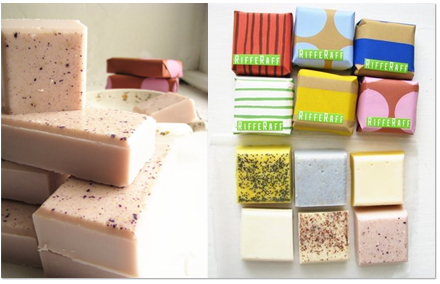 Can you tell us what sets your soap apart from what's currently available on etsy? I know bath and body is an extremely popular category so I definitely wanted to have my own niche. The bright and bold printed wrapping papers are the most visible element that sets me apart. For that reason I think my soaps make great gifts so I will really be concentrating on adding gift sets and promoting that side of my offerings. Since I make both the soaps and the papers, I also think that will allow for some really fun options when it comes to doing custom creations down the line. Hmm, good question! Anthropologie, Rare Device, and I can't think of another at this time. Truth be told, having lots of huge wholesale accounts is not my ultimate goal. When you sell wholesale you only get 50% of the price, I'd rather sell directly to customers and get 100%. So my goal is to have flourishing online sales, maybe a B&M storefront of my own one day. 6. Artists, designers, bloggers who often work from home alone develop some pretty unique and quirky habits. Can you share one of yours? Well I don't work at home alone, I work part time at the public library. I like that for the regular income but also because it forces me out of the house on a regular basis. My boyfriend always jokes that I'd be the perfect candidate for the space station because I have no problem going days without leaving the house or talking to anyone else except for him. I like to cook and I think I'm pretty decent but I have never been able to bake anything successfully that wasn't from a box. That's ok though because I'm much more of a savory person than a sweets person. I'd take a sausage or some cheese over a cupcake any day. I cannot swallow pills whole so I chew them. Yes it's gross, so I was thrilled to find Trader Joe's has chewable vitamins for adults! I've never really enjoyed staying out late, even in college. I always walk in a diagonal line across intersections instead of going all the way to the corner: the shortest distance between two points is a straight line, I say. I get a little thrill when I'm able to pay for something with exact change. Good Luck with your new Etsy venture! Lovely blog as well! So great and all the best with your lovely new line of soaps. This is indeed inspiring! Thanks for this inspiring interview! Her soaps are wrapped so beautifully! Make It is such a great blog! I'm so glad you featured her, not only so I could read more about her experience, but also because I know it's such a great thing for her business and blog! GO SHANNON!! 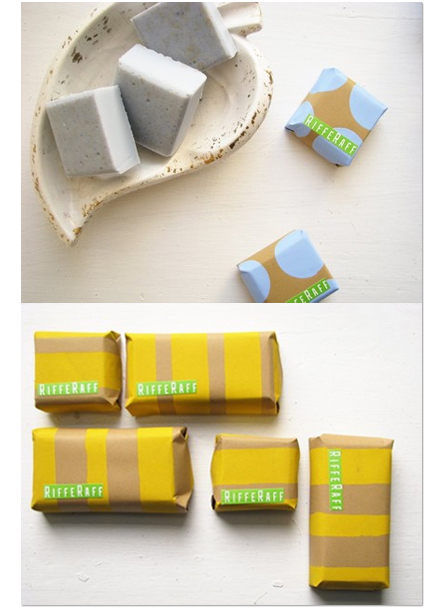 I love the soap packaging - I would be so happy opening one of those! Shannon is the sweetest - and so generous with her discoveries and learning curve! I enjoy her style sooo much!! Nice to see her here! Nice post! I love it and I enjoyed reading it. I wanna try that one, seems so interesting. Perfectly for a gift. Thanks for sharing.